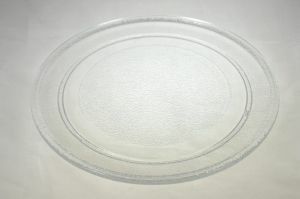 Glass turntable tray for microwave ovens, 245 mm. Glass turntable tray for microwave ovens. Sharp R-270KW, R-270SLM, R-658KM, R-658SLM, R-658WM. Panasonic NN-E225MB, NN-E222MB, NN-E205WB, NN-E202WB, NN-K105WB, NN-K125WB, NN-K155WB, NN-E255WB, NN-E255MB, NN-E238MB. The glass turntable plate is a lot lighter than the original so hopefully it will still last as long. It fitted perfectly.